The Seattle Times readers tasting panel samples six, and here’s what they found. IT’S ONE OF THE more obscure grapes in the world of wine, but you are likely to start seeing more of it on store shelves in coming years. Roussanne is a white grape traditionally grown in France’s Rhône Valley, and it’s starting to make inroads in the Northwest. Roussanne (pronounced “ROO-sahn”) often is blended with other Rhône white grapes, including marsanne and grenache blanc. Here in the Northwest, we often see roussanne blended with viognier and marsanne, but now it is showing up as a single-varietal bottling. It’s still a rare grape, with perhaps a few dozen acres being grown in Washington — and even fewer in Oregon. 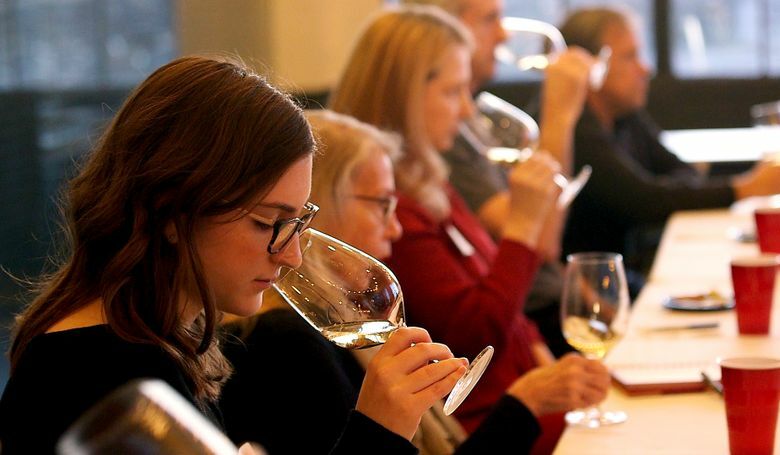 As such, no regional style has taken root, as was evident in March when The Seattle Times readers wine tasting panel gathered at Esquin Wine & Spirits in Seattle to examine six bottlings. They varied from off-dry to oak-aged, and all six were stylistically different. This made for a fascinating tasting with our readers. Because it still is such a rare grape in the Northwest, finding roussanne will be difficult. Most examples are sold only in winery tasting rooms or to wine club members. But be sure to check with your favorite wine merchant, too. 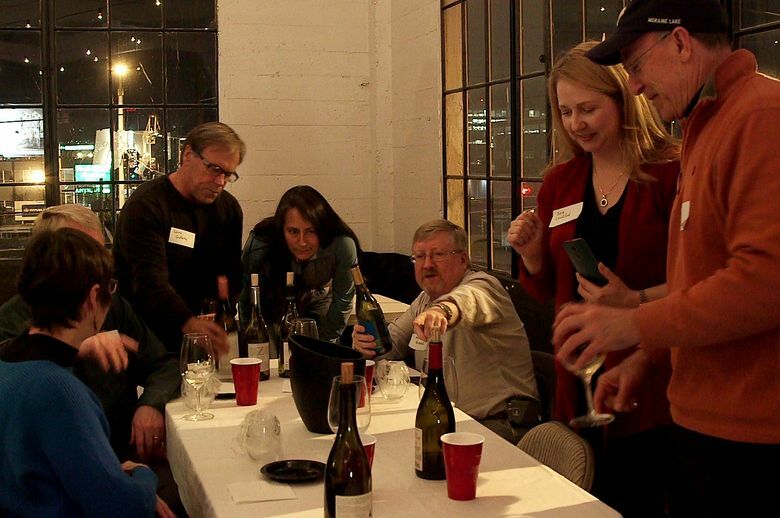 The Times panel gathered at Esquin, one of Seattle’s oldest and most respected wine shops, to taste through a selection of Northwest roussannes. The wines were tasted blind and in random order. Here are the panel’s impressions in the order the wines were tasted. Coyote Canyon Winery 2013 roussanne, Horse Heaven Hills, $22: This winery in the Yakima Valley town of Prosser has crafted a luscious, juicy white with delicious aromas and flavors of ripe pear and peach. Zerba Cellars 2012 Cockburn Vineyard roussanne, Walla Walla Valley, $24: From the Oregon side of the Walla Walla Valley, this is laden with bright orchard fruit aromas and flavors and would pair beautifully with grilled chicken or seared scallops. Doyenne 2013 roussanne, Red Mountain, $36: This wine from DeLille Cellars in Woodinville is sold out, but the 2014 is now available. It’s a gorgeous effort with austere notes of apple and Asian pear, perfect with grilled halibut. Eleven Winery 2013 Elephant Mountain Vineyard roussanne, Yakima Valley, $24: Eleven is on Bainbridge Island and gets the grapes for this wine near the Yakima Valley town of Wapato. It shows lively and bright fruit backed with rich structure. Barnard Griffin 2012 roussanne, Columbia Valley, $20: Rob Griffin has been making Washington wine since the mid-1970s and loves to experiment with emerging varieties. He and his team at this Richland winery nailed this example, thanks to aromas and flavors of clove, nutmeg and bright orchard and tropical fruit. Amelia Wynn 2012 roussanne, Yakima Valley, $23: Bainbridge Island vintner Paul Bianchi experimented by crafting this roussanne in oak. The result is a wine with rich flavors of orange, pineapple, coconut, toffee and vanilla. Andy Perdue is a wine author, journalist and international judge. Learn more about wine at greatnorthwestwine.com. Katie G. Cotterill is a Seattle Times videographer.